Since I finished the Smocked Diaper Shirt from the previous post, I needed something simple to work on while it's my turn to ride to work (Remember - I'm carpooling now). 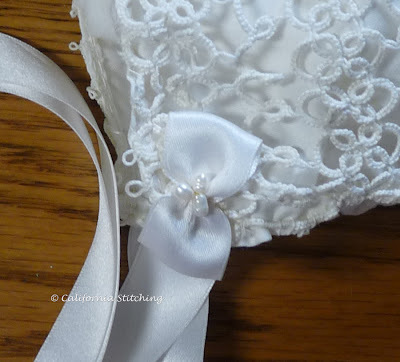 I didn't have the time to start something new, so I once again turned to my very large stash of UFO's and found this christening gown kit from Wendy Schoen's Embroidery Club of several years ago. 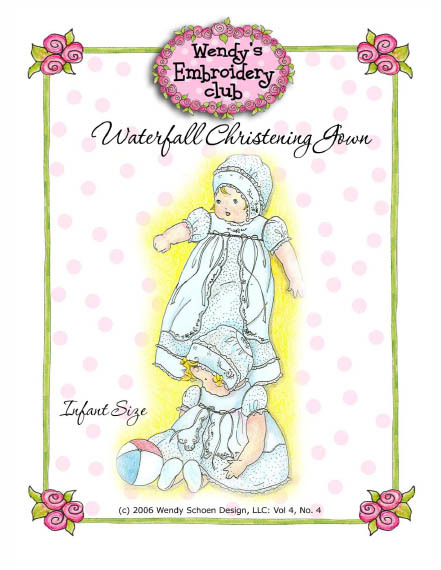 Wendy is no longer offering her Embroidery Club, but you can still buy the pattern, along with the fabrics, laces and floche on her web site. The front panel Madiera applique is finished but I have quite a long way to go on the embroidery. It's all stem stitch, fishbone stitch leaves and pinwheel bullion flowers, all worked in bright white DMC cotton floche. I'm going to try to finish the stems, leaves and the split stitch foundation for the flowers at home so I can concentrate on the bullions while riding in the car. 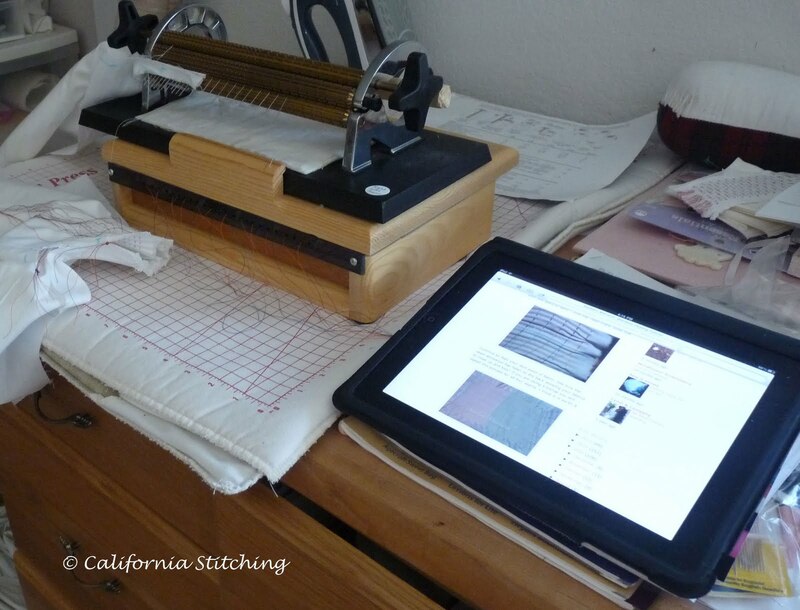 Now it's off to do some grocery shopping, then to the Long Beach Quilt Show! I should have a few pics for you of the lovely quilts. This is a quickie post to show you the finished Smocked Diaper Shirt. The original smocking plate, from a forgotten issue of Australian Smocking and Embroidery, had an extra row of smocking echoing the bottom of the hearts, roses in each and every heart, and little french knots at the apex of the bottom row. 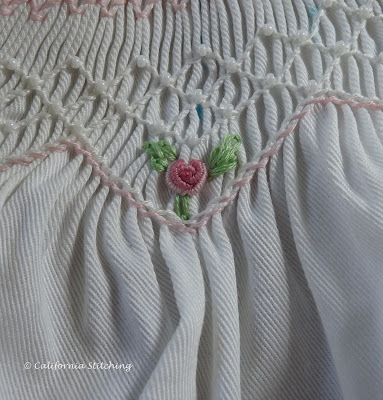 It was long after I finished the smocking and was almost through half the roses that I realized I had left out that bottom row. Oh well! Since I had already removed the pleating threads there was no way I was going to try to add that last row, and I didn't feel it warranted pleating the remaining rows by hand so I could add it. 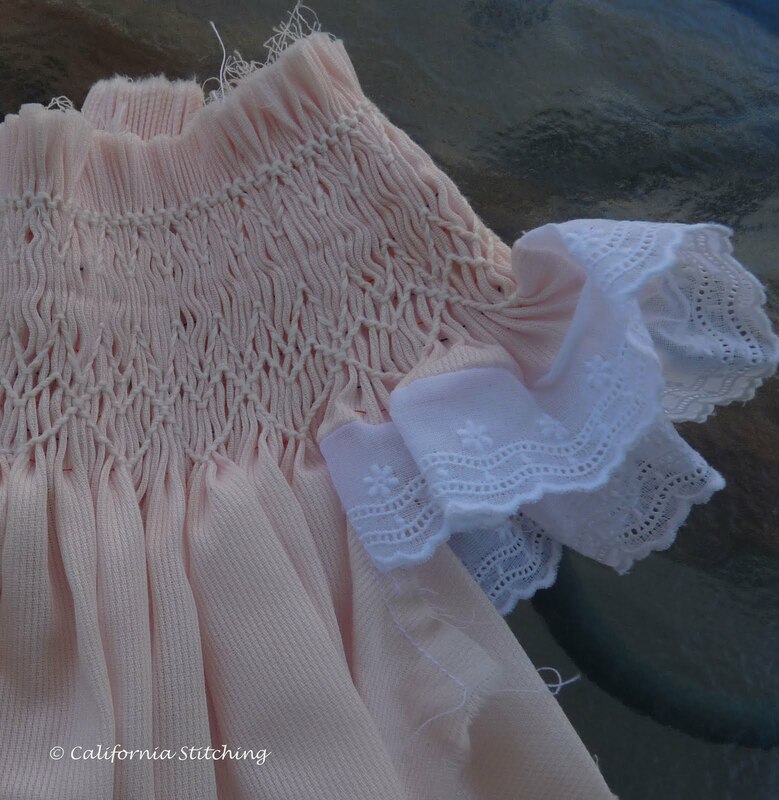 And free form smocking never works. I had decided to add the roses in every other heart to see if I liked the "lighter" design, and I found that I did. 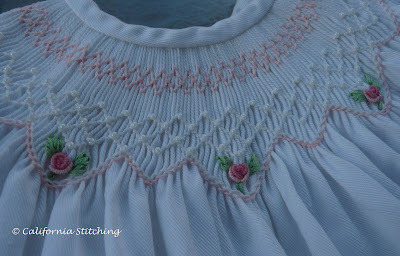 Luckily, the center heart was in the very center of the smocking, so I could get away with half the embroidered roses. Since I smocked way too close to the selvedge edge, I just turned it under once and topstitched it down. As I mentioned before, I really don't like thread loops, which seem to be prevalent in bishops, so I added plastic snaps. Nice and easy for a new mom to use. 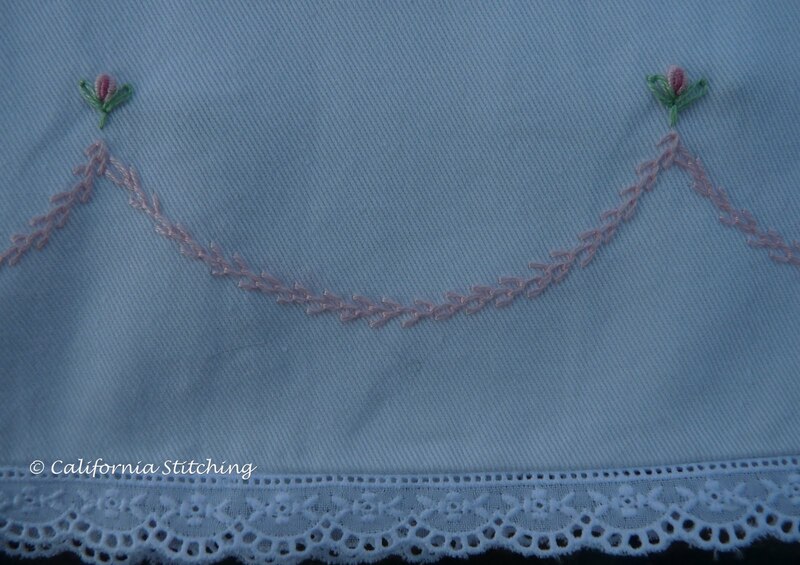 Here's a close up of the pinstitching on the Swiss embroidery. 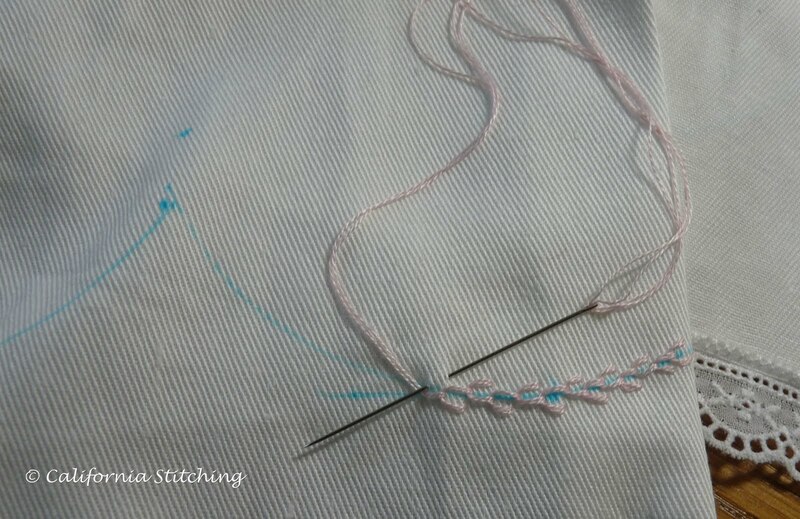 To repeat myself from the last post, I used Madiera Cotona thread size #80, stitch D7, W and L = 2.5 on my Husqvarna Designer I. I forgot to specify the needle, which was a brand new 100/16 Schmetz general sewing needle. It needs to be brand new as it has to be sharp enough to penetrate the rolled and whipped seam allowance. And here's the final dress, waiting for the little darling, who should make her arrival in mid September. No news yet on the one due 1 1/2 weeks ago. 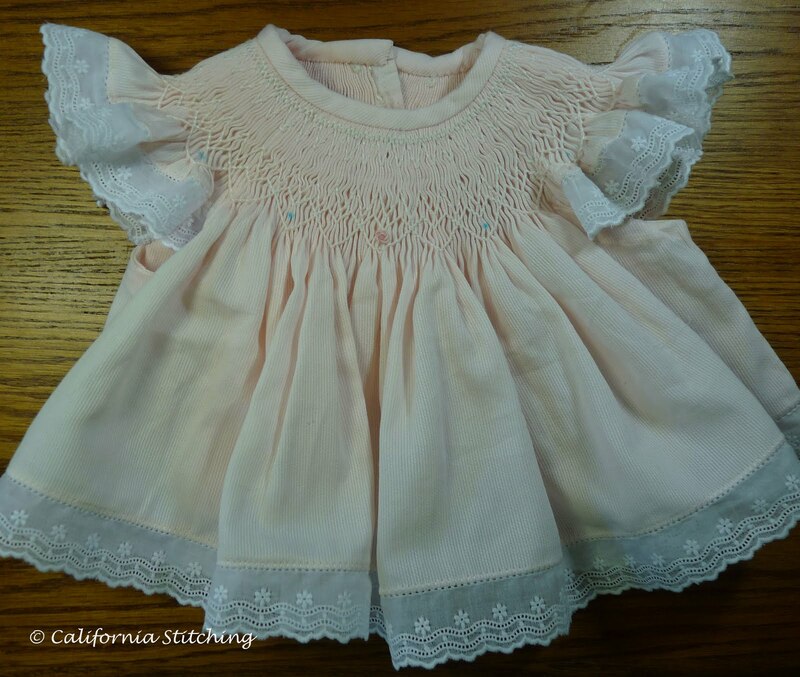 While rummaging around in one of my seriously large boxes of UFOs, I came across this rather forlorn looking smocked diaper shirt that I had started for my granddaughter. Since she was huge, a nine pounder, she outgrew the newborn size before I could finish it. (I always joke that she was a month old when she was born) So now I'll finish it for one of the grand nieces that are due to make their appearance soon. 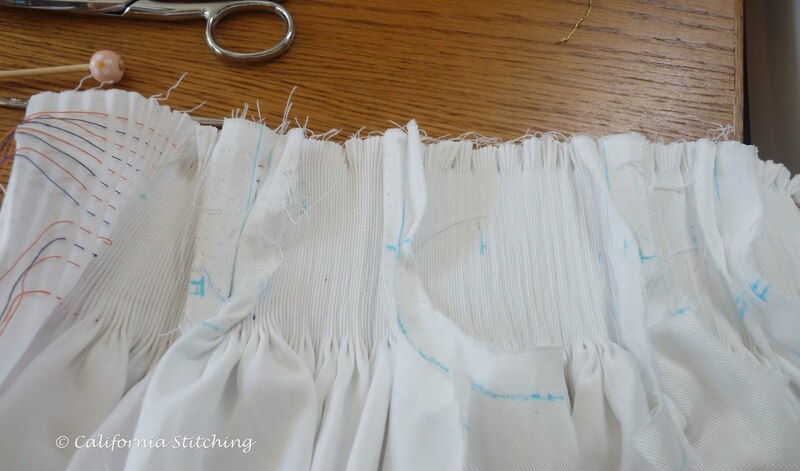 If you look closely at it, you'll see that the hem of the front was torn, not cut, making it straight with the grain of the fabric. Compare this to the two back pieces and you can see the raveling from the slightly uneven cutting job I did. 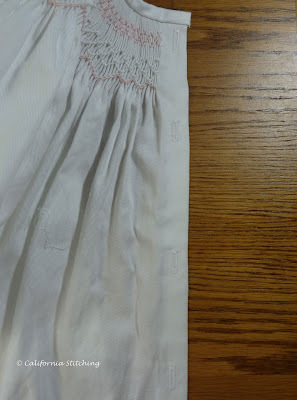 I also smocked too closely to the selvedge edges which make up the back closing, which will be difficult to finish. Something about this edging really bothered me. I thought about it for several days until I figured it out. It was lumpy and didn't lie flat against the fabric no matter how much I ironed it. 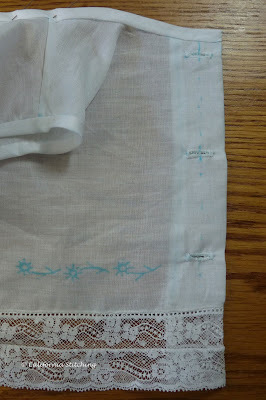 I think this is because the Swiss edging is stiffer than the dress fabric, which is a cotton baby-lined pique. I have no idea where I bought the fabric. 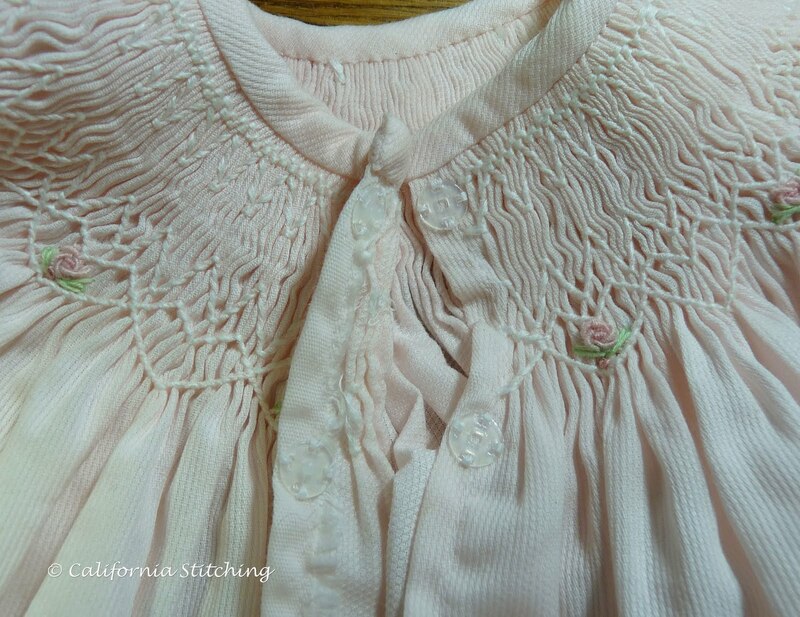 When I found the project in my UFO box it had a photo copy of a smocking pattern from Australian Smocking and Embroidery, but no reference to any fabric type, issue number, or anything else. This is one of the reasons I started blogging, to make myself take notes! I finally figured out that I needed some stitching on the seam line to give the edging/fabric transition definition so it will look somewhat smoother. 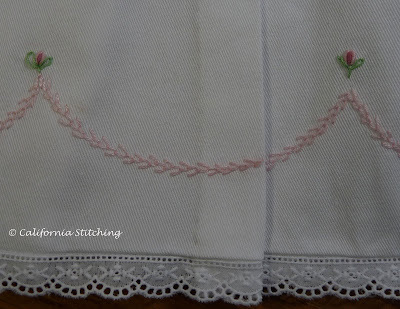 I tried out a few of the heirloom stitches on my machine first on the pink pique above, then on he seam line below. As I've mentioned before, I have a Viking Husqvarna Designer I, and the D stitches refer to the heirloom group of stitches. I tried them out, finally settling on D46 L and W 2.5 using Madiera Cotona thread size #80 (that's pretty fine!). The #60 in the photo refers to Mettler Embroidery thread. It's somewhat hard to tell in the photographs, but the finer thread seems to look a bit more handmade. Notice the smearing of the notes in the upper right hand corner. I thought I'd be clever and wash out the blue lines, but the black ink turned out to be water soluble. Next time I'll use the Pigma pen for the notes. 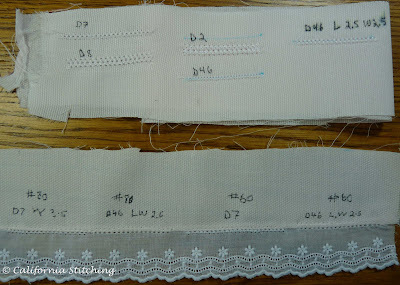 As you can see, the machine pin stitching, stitch D46, is just the ticket. The transition between the edging and the fabric is much smoother, especially noticeable on the angle wing sleeves. I also finished the top edge and underarm edges with bias binding, and managed to make one bullion rose in the center smocked heart. For the back opening, I turned under the seam allowances just once as that's all I had room for, and topstitched it 1/4 inch from the edge. Note to self: leave more room to turn under! I'll have to use snaps to close the opening as that is all that I can manage in that space. Many bishop patterns call for buttons and loops made out of chained stitched floss. I don't like these and prefer something a bit more solid. There needs to be a transition between fabrics when the weight and drape differ, as with the dress fabric and the Swiss edging. You can generally use entredeux, but in this case the pin stitching worked quite well. Leave enough room at the ends of the smocking for the back closure. If it's too much, you can always trim it. 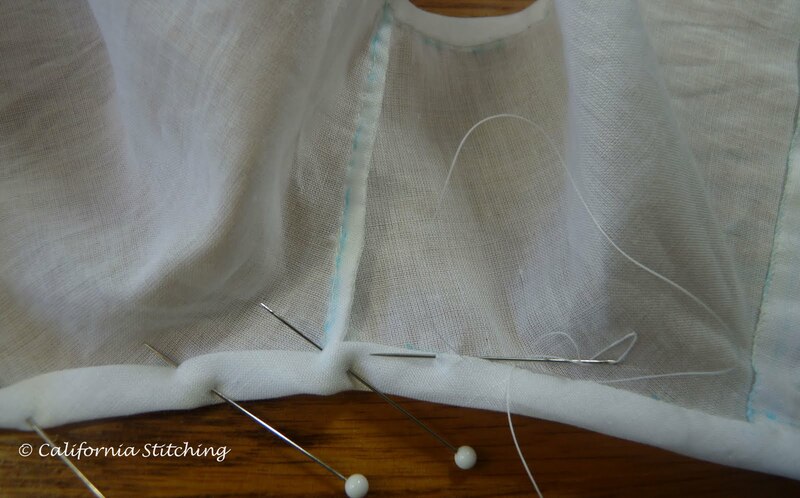 Use the finest thread possible for machine pin stitching, to make it look a bit more hand made. I discovered this in another class on a lovely baby dress which I will post about soon. Make samples, label them, and keep them in a notebook. They are invaluable references. The darling baby items I have been making are for two grandnieces that are due to be born soon, one in Ontario, Canada, that was supposed to have made her appearance a week ago, and the other here in Southern California that won't show up until mid-September. I am throwing the baby shower for the second niece, so am pretty busy on that as well. I hope to finish the embroidery in the car this week on the two days that my carpooling partner drives. Wish me luck! 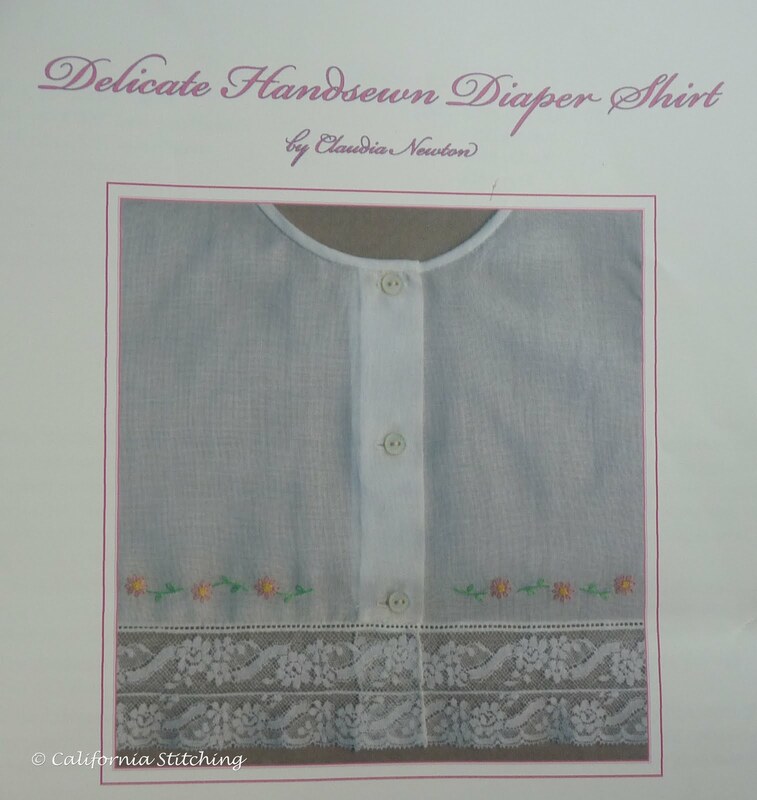 Delicate Handsewn Diaper Shirt Finished! Another finish! Doesn't it feel great? This little diaper shirt is really pretty simple to sew, making it an ideal project for a handsewing beginner. This project is from an old SAGA class by Claudia Newton that had been sitting in storage for more than a couple of years. It worked up so quickly that I'm sorry I didn't get it out earlier. 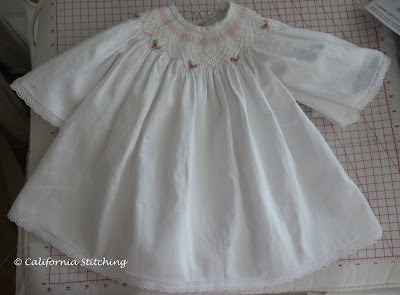 I'm not exactly a beginner at handsewing, having made this French Acadian Christening Gown several years ago, almost entirely by hand. 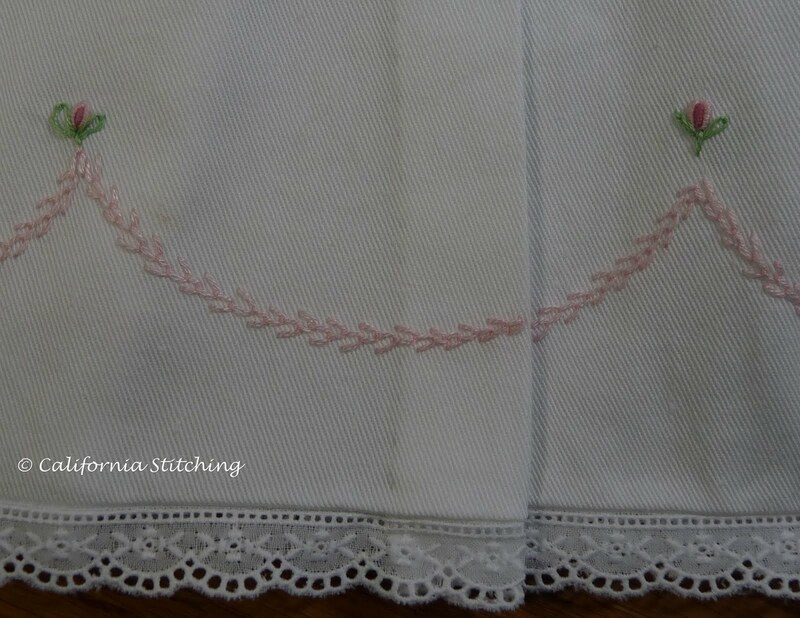 I say almost because I did cheat a bit and made the buttonholes by machine, using the heirloom buttonhole stitch, B9 on my Viking Designer I. This time I made them by hand. They're a bit wobbly, but I'm sure I'll improve with time. They look much better when washed and ironed, as you can see in the first photo. The neck and armhole finishes were very simple, just a bias band sewn to the edges after basting the seam allowances. 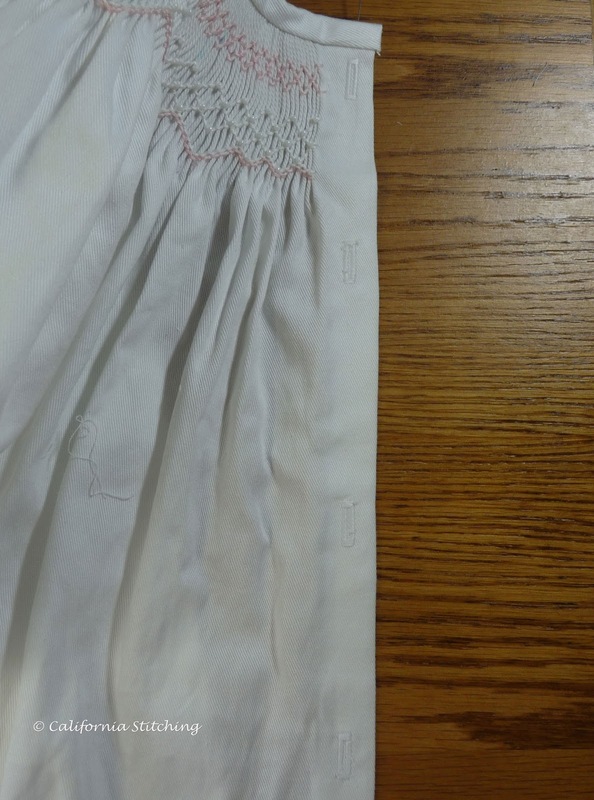 Note the french seam at the shoulder. 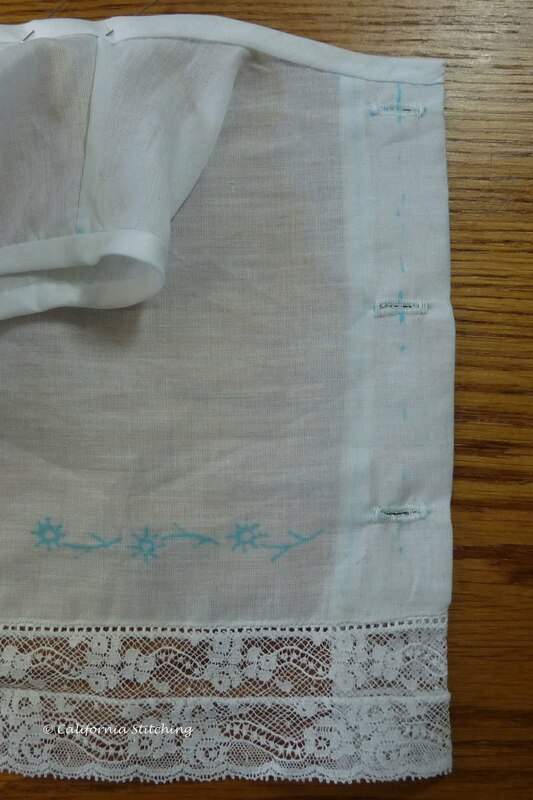 You can barely see it, but the end of the lace is turned under, whipped stitched, then stitched over with a buttonhole stitch and trimmed very close to the end. 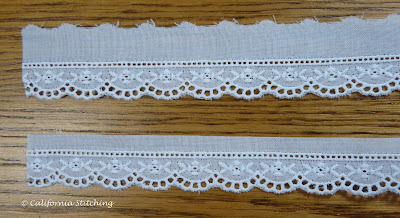 It make a really nice finish for the lace, which is very hard to roll and whip. The facings are finished with a tiny whipstitch. And finally, a Ronald Reagan rose to brighten up the mess on my sewing table. I've only made two complete items of clothing by hand, this shirt and the gown mentioned above, but it's a very satisfying and relaxing way to sew. It's also nice to know that I can make a garment by hand, just like our forebears had to. I've always loved the "Little House" series of books by Laura Ingalls Wilder, especially one section in which the family buys a sewing machine and were so thrilled with it! 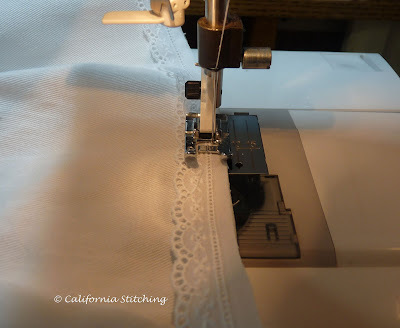 Now they could sew muslin lengths together for sheets in minutes instead of hours! It's now Saturday morning and I have maintenance scheduled for today, first a trip to the hairdresser then a pedicure. Maybe I can squeeze in an hour or two stitching in the afternoon. I have another old project that I started when my granddaughter was a baby, but didn't get it finished in time. It's finished! My Baby Bishop I is finished for my niece who was due to deliver her first baby this past Sunday. I'm calling it Number I because I have another niece who is due to deliver in mid September, and I hope I'll have enough time to make another bishop for her. 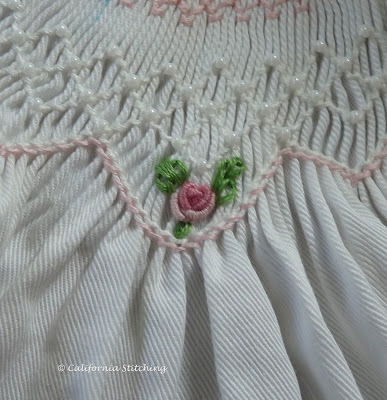 Bullion roses embroidered on the smocking. 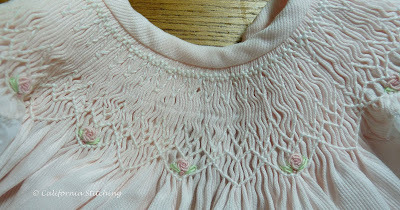 The pattern calls for weaving ribbon through the top two rows of the pink smocking, but I decided I really didn't like it. I just wish I would have thought of this earlier and adjusted the white smocked section upwards with lots more beads. Oh well, live and learn. 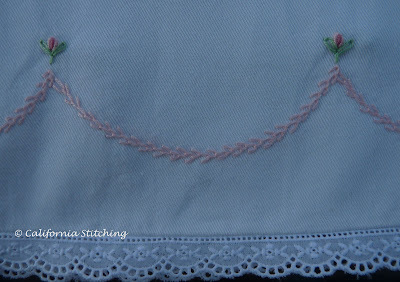 I decided to add scalloped featherstitching to the hem of the dress, with little rosebuds at the apex of each scallop. I even had the featherstitching match at the back opening. But boy, does that featherstitching look B A D. I'll have to fix that section on the overlap. Not to mention really work on the photography! If you recall, I made this dress out of cotton twill that I purchased from Joann's Fabrics, a discount fabric store that is prevalent in the US. I say discount, but they do seem to be upgrading some of the fabric selections. This fabric is a fairly nice cotton twill that comes in several colors and is very nice to work with, although it seemed to be rather difficult to straighten out at first as my previous post on this subject describes. The really nice part is that after washing the dress and hanging it to dry it looks pretty good so the new mum (she's Canadian, so I'll use their term) can get by without ironing the dress. 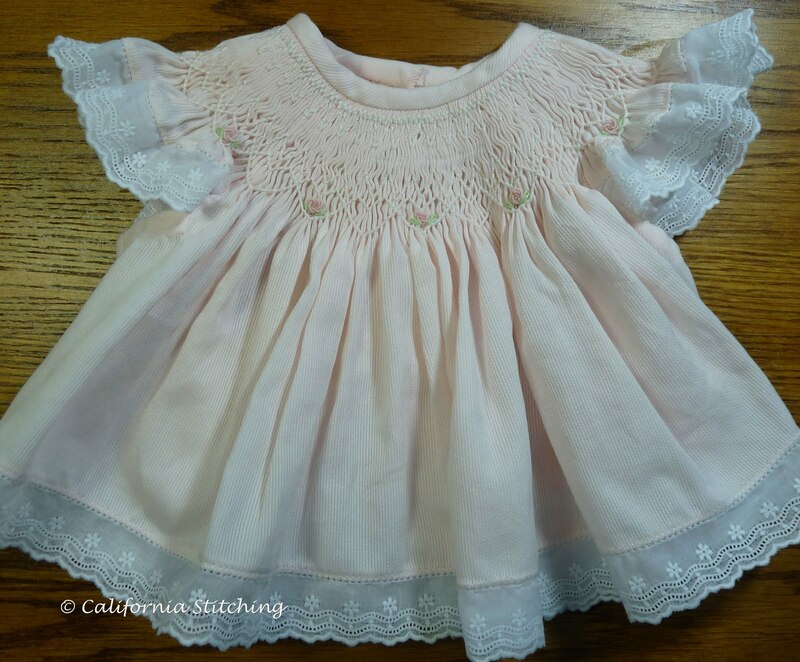 The baby was due this past Sunday and we haven't heard a bit about labor, so I'll be patient and package this lovely dress when the little darling makes her appearance. This past week was the first week in over a month that I've put in five whole days at work, so I haven't accomplished too much. But this morning I spent several hours sewing and have done quite a bit! The first thing I did was work on the buttonholes. I actually put them in before I attached the neck binding, just forgot to photograph it until later. Most are a bit ragged, as I have this love/hate relationship with my buttonhole attachment. The top hole looks pretty good, but all the rest had issues when stitching them out. On each and every one of them the program stopped stitching the second bar too soon, so I had to resort to using the satin stitches in two widths to finish them. Luckily, this wasn't too hard. I have a Viking Designer I and the applique stitches F3 and F4 (adjusted to 4.5 width), matched the buttonhole stitch B2 perfectly. Someday I'll have to sit down and figure out why the buttonholer is so wonky. Then I rummaged around in my stash and found several yards of this sweet Swiss edging. The bottom view is trimmed to 1/4 inch to better align it to the edge of the fabric. 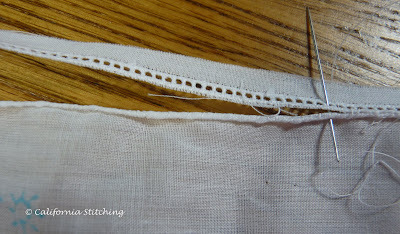 I haven't found a good tutorial on attaching Swiss edging to fabric, so when my current rush of projects is over I may sit down and make one. If anyone knows of one, please let me know! However, I do have a tip. I use the B foot to attach any entredeux type edgings, as it has a groove on the bottom so the entredeux can easily be centered in it. 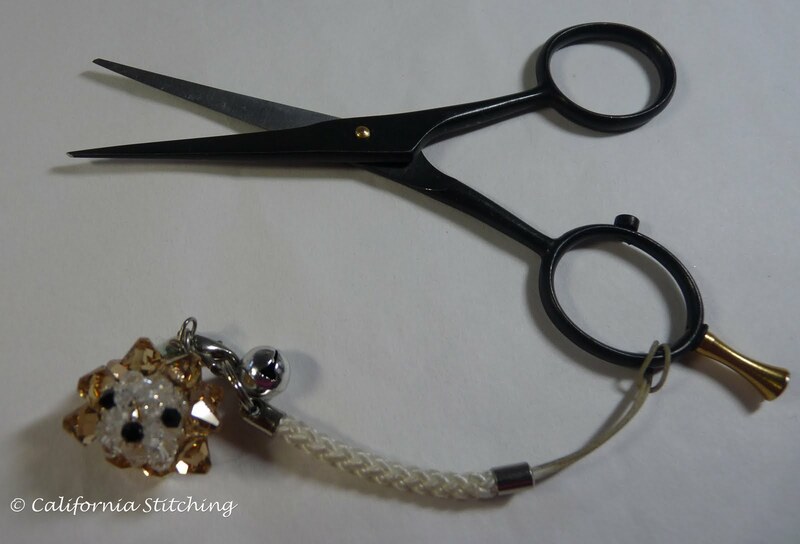 Then I move my needle position 3.0 to the right, and the needle is always perfectly positioned. All I need to do now is to add the elastic in the sleeves and all the handsewing of the neck binding, back opening facings and the buttons. 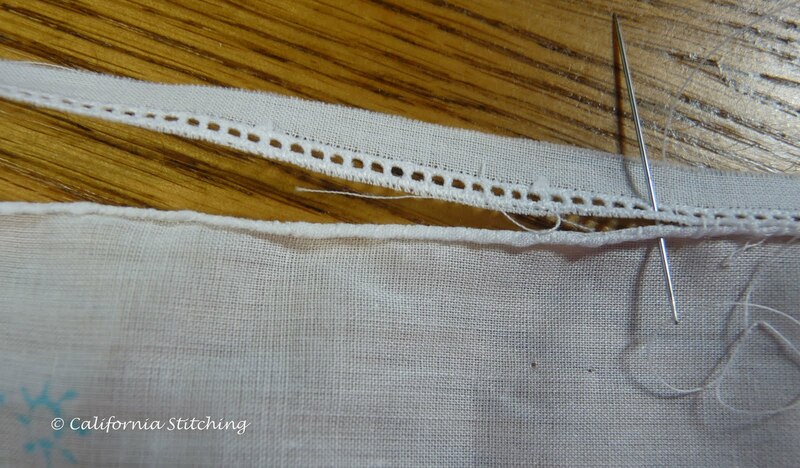 After I took the previous picture I decided it needed something around the hem, so I drew scallops that bottomed out 1 inch above the fabric edge for some featherstitching. I'm using two strands of the pink floss that matches the smocking. The dot above the peak of the scallops mark the spot where I'll add either a bullion rose or bud, depending how long it takes me to do the rest of the handsewing. Now it's time to sit on the patio with an iced tea and stitch! Well, here it is Wednesday and I haven't made a bit of progress on the Baby Bishop from the last post. I needed something to stitch in the car on Tuesday, which was my turn to ride, and wasn't ready to do any more on this dress without some serious thinking. 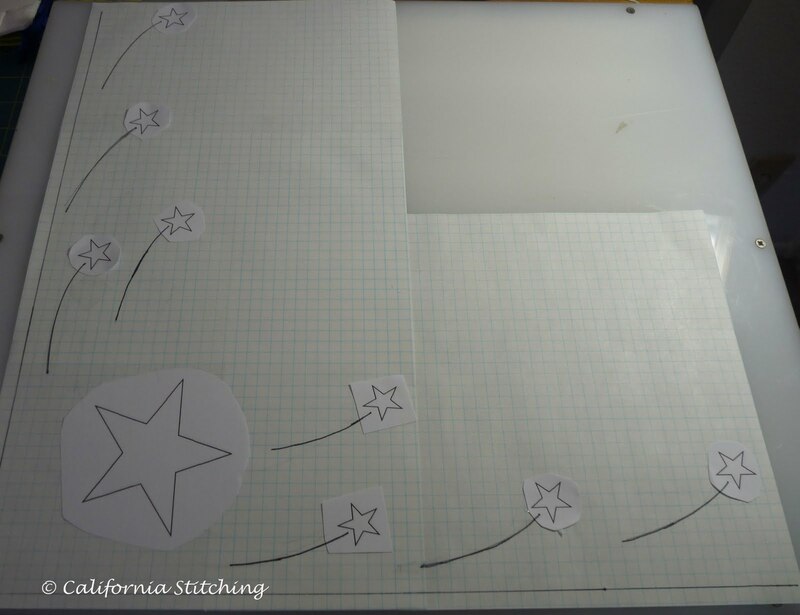 I need to formulate in my mind how I want to embroider the hem and sleeves, then draw out the pattern and get going. I hadn't arrived at a design, so I rummaged around in my stash and found this kit for a Handsewn Diaper Shirt. Isn't it sweet? That's the front, by the way. This design is by Claudia Newton, who specialized in teaching lovely whitework and handsewing at SAGA conventions and other venues around the US. In fact, I'll be taking two classes from her this fall. The kit had been sitting in my box of kits since 2007, which was the last SAGA convention I had attended, in Dallas, Texas. Claudia had provided us with a practice piece which was all I finished during the class. So it sat until I pulled it out Monday evening and went to work. 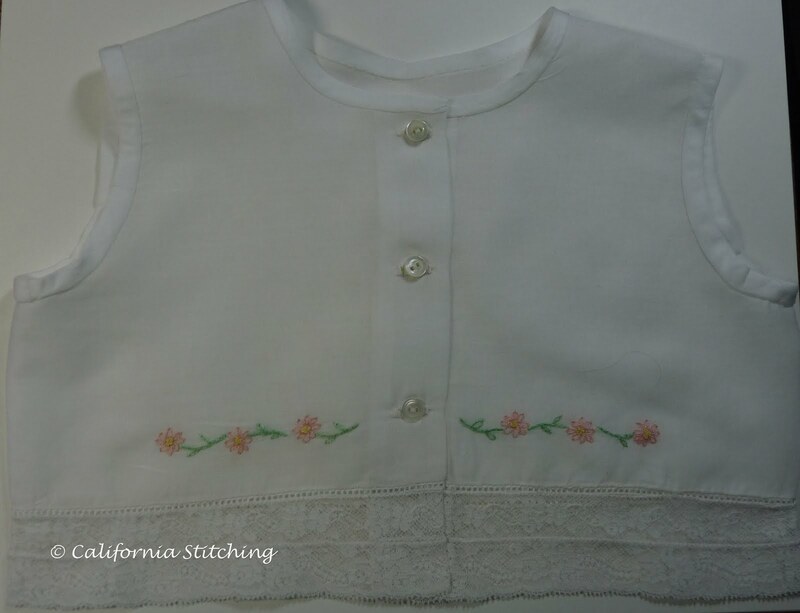 It has some very simple embroidered flowers on the front, as you can see from the first photo. We had the floss in the kit with the needles and a bit of thread - you can barely see it wrapped around the paper, for the practice piece. 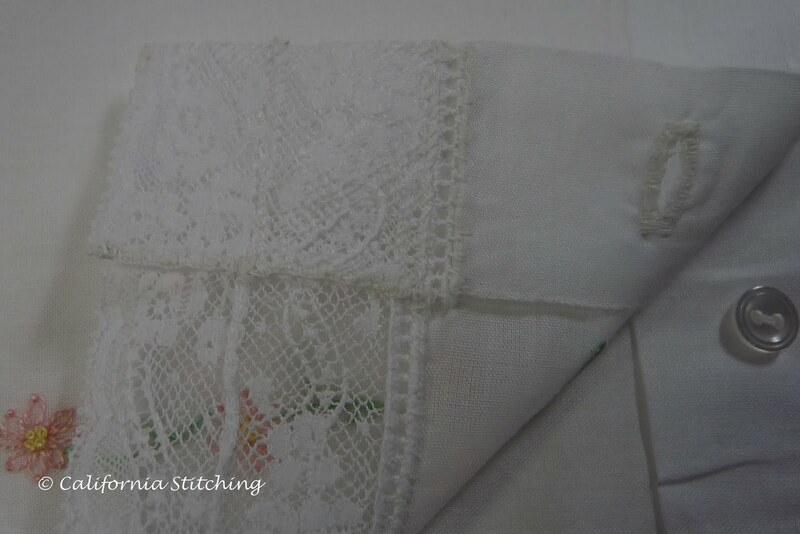 The fabric is beautiful white batiste and is a joy to work with. It finger presses so easily you don't need to iron while sewing. I traced out the pattern and sewed down the facings. These are pretty simple, the fabric is just folded and whipped in place. I then rolled and whipped the lower edge, which you can just see on the side. I know this camera has a macro function, which I will have to get my husband to teach me how to use. 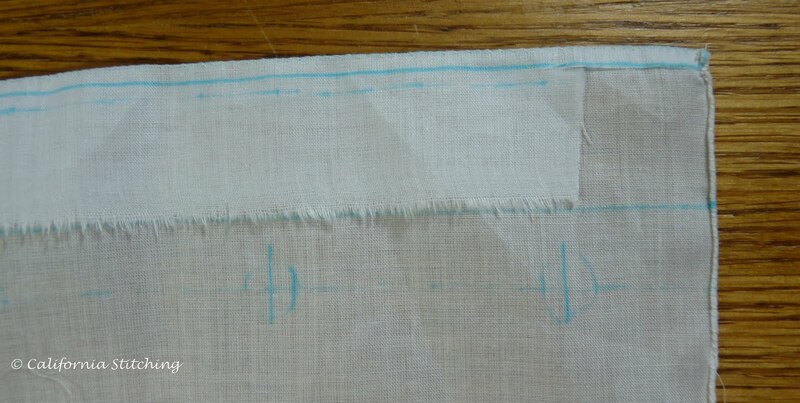 Then I cut off the fabric on one edge of the entredeux and whipped it to the rolled edge, right sides together. I always see instructions that tell me the smoother side of the entredeux is the right side, but I've never been able to tell the difference. Remember that I said I took this at the SAGA Convention? During the class I sat next a dear lady named Marlene, who had these fabulous Dovo scissors. They are serrated on one edge, so they grip the fabric, making it almost impossible to slip and make a mistake. She offered to make a trip out to BessieMary, an heirloom sewing shop in Dallas, who was offering the Conventioneers a sale price that evening and pick up a pair for me. Thanks Marlene and Jan (who owns BessieMary)! I'm sorry I never made it to your store but hope to meet you sometime! So now I have three projects in work, the Bullion Wrap Dress (I finished the embroidery, finally! 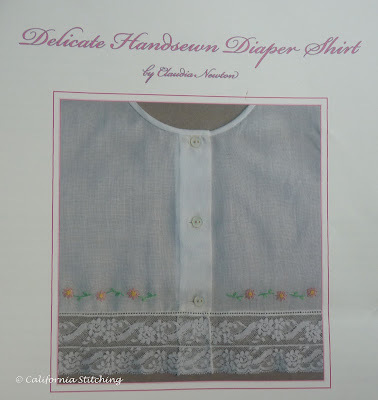 ), Baby Bishop I, and now this Handsewn Diaper Shirt! 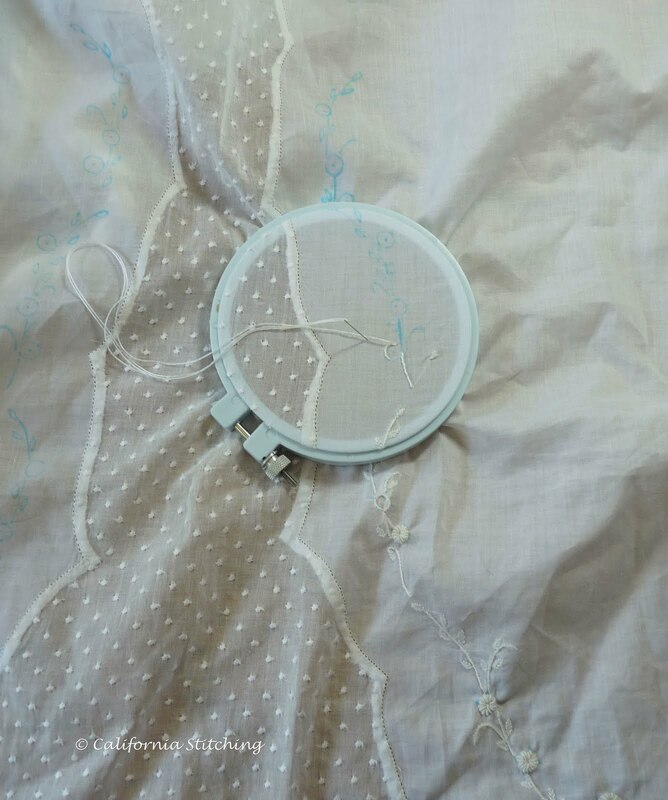 Wait until you see the embroidery projects I have lined up! My carpooler went on vacation for the rest of the week, so I won't have much chance to sew until the weekend. During this weekend I caught the gardening bug, so wasn't able to work on my grand niece's bishop as much as I would have liked. I did manage to finish the smocking and block it before proceeding on to the embroidery. 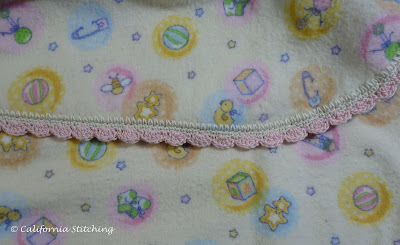 I like to add beads to smocking, it adds a bit of sparkly without overdoing it. 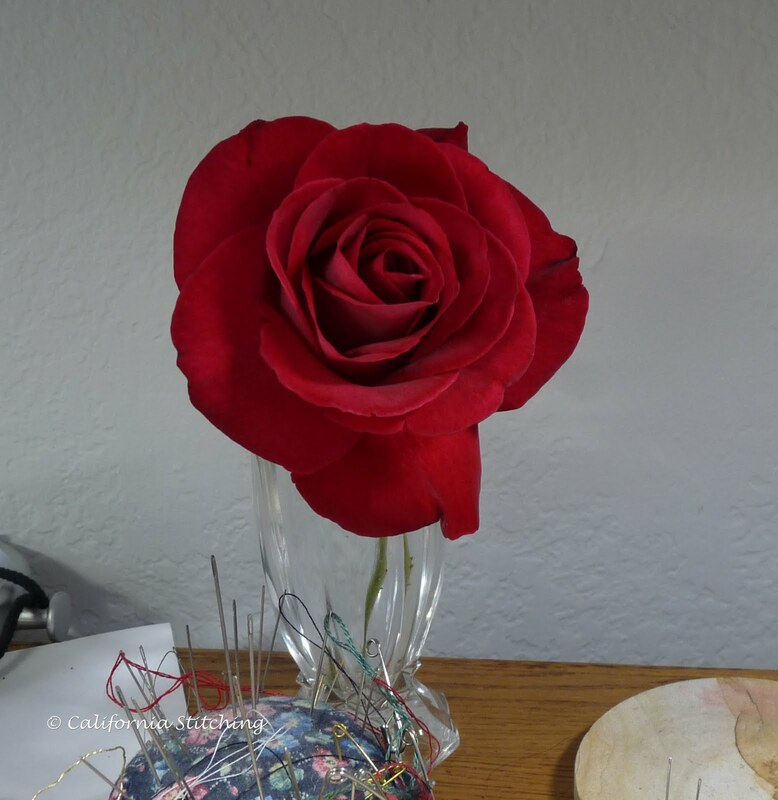 I then worked the bullion roses in the large hearts. 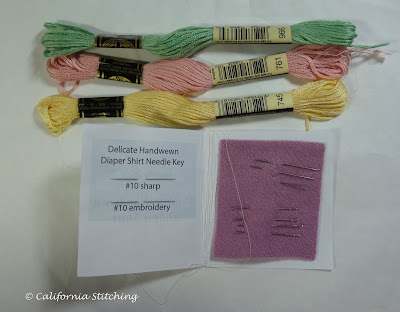 These are a bit different from any that I have worked before in that it calls for a French knot in in the darkest color for the center, then three bullions in the medium color, then two bullions on the sides in the lightest color. The leaves are detached chains but look how bright they are! I realized then that this green was just too bright for this dress. I wanted a look that was more delicate, and bright just isn't the way to say delicate. So I switched from DMC 989 to 184, which is the much lighter green that you see in this photo. Just right, in my opinion. The pattern calls for cable flowerettes in the small hearts, but I may do something else, such as a small bullion bud, or just leave them blank. I still have to figure out how I want to finish the sleeves and hem, and will work on these during the week. It's now Sunday evening, and I'm sick of gardening. 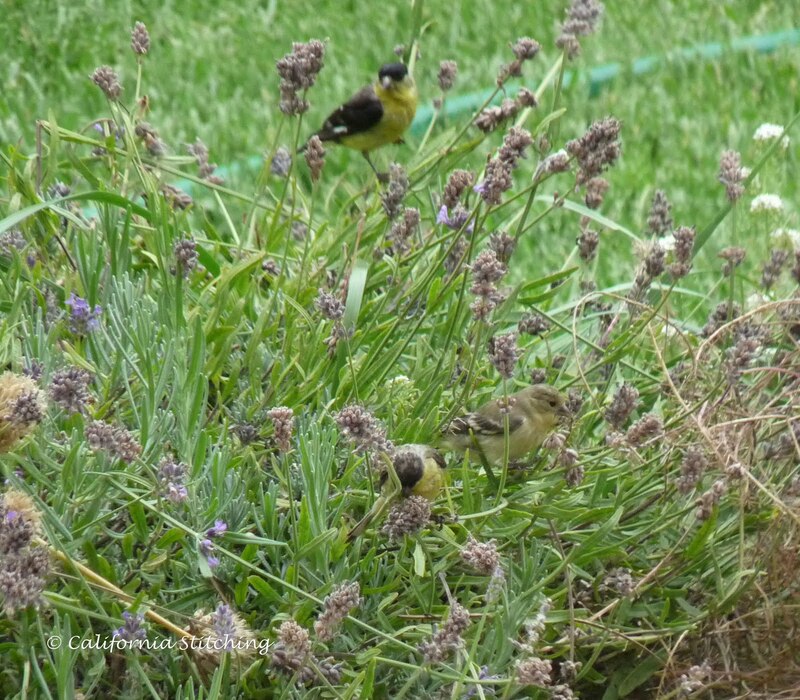 We did a bit of bird watching from the back yard patio and caught these goldfinches feeding on the lavender buds. I've mentioned in previous posts that I have a terrifically long commute, 65 miles one way which takes close to 2 1/2 hours each and every day. So luckily I was able to start carpooling with a coworker that just joined our team. Now, all of a sudden, I have over 2 hours every other day extra in which to stitch! Granted, I have to make sure the projects I take on the road don't require magnification beyond my reading glasses, but I think I can manage that. Remember the crocheted baby blanket post? Well, here is the finished blanket, all ready to be shipped off to a new little darling! 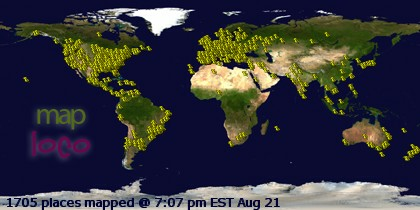 And the Bullion Wrap Dress from August of 2010? The bullions are all finished and I only have a few leaves to go. I might just get this made before my granddaughter grows out of it. But best of all, we have several common interests. We've been listening to Harry Potter and the Deathly Hallows from my iPod to get ready for the final movie, due out shortly. But I managed to forget to turn off the iPod this morning when we left the car and the poor thing was completely drained by the time we got to the car to return home. So we listened to some old radio shows on my carpooler's satellite radio instead. Today's selections were pretty awful, a program called "Escape" from the 1950's, one of which involved a marionette which turned out to be the alternate personality of his handler. The only redeeming part was that the marionette's voice was that of Art Carney (Ed Norton of the Honeymooners, that's even before my time!). Other days we have listened to H. G. Wells or George Burns and Gracie Allen. Great fun, not to mention the gas we both save. This weekend I'll have to prepare other projects that can be worked in the car so I'll always have something to occupy my time. I've mentioned several times that I have two grandnieces due to be born shortly, and I just realized that the first is due in less than two weeks! That means Auntie Cindy better get cracking! I found some nice (well, I thought so at the time) cotton twill at Joann's and dug out my favorite baby bishop pattern, "Baby Bishops" by Chery Williams. I'm making the long daygown with long sleeves in three month size. I figure three months from now in Ontario, Canada, it will start to be getting chilly. I bought three yards of the fabric, as I figured I could use it for other things, especially embroidery, but I'm completely frustrated as it won't hang straight! 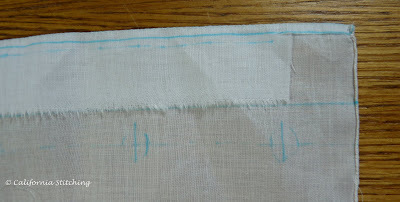 I tore one edge, selvage to selvage, lined it up and ironed it but I can't get the rest of the fabric edges to match. So I stretched it in places, and it came somewhat under control. I think for a small baby dress it will be OK. 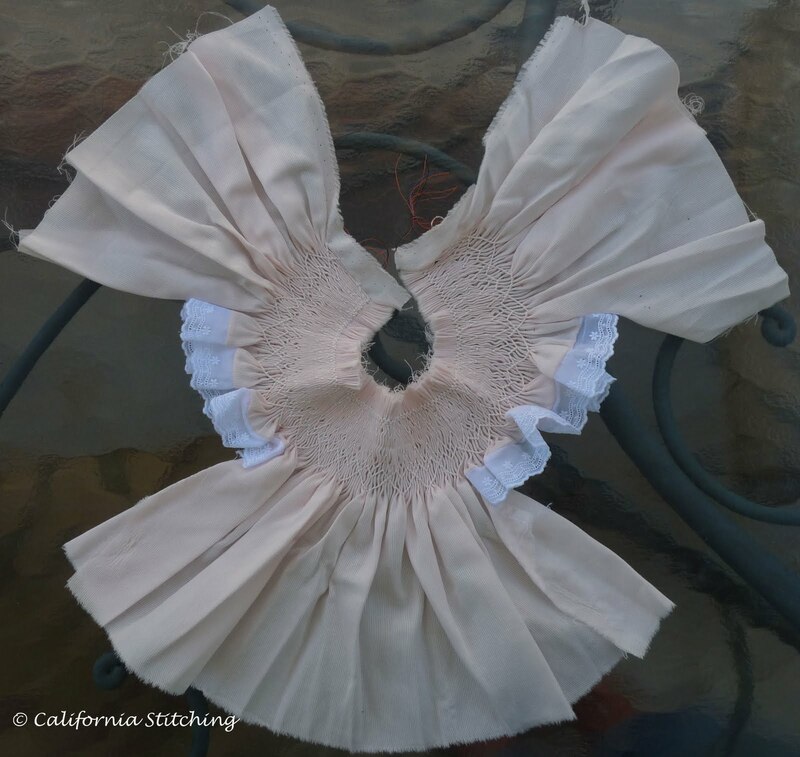 Since this is cotton twill I figured it would be really, really painful to pleat so I looked up Martha's Seamless Pleating Tutorial at Southern Matriarch and decided to go with Method #2. Here's the bishop just starting to come through the pleater. Isn't that iPad handy? 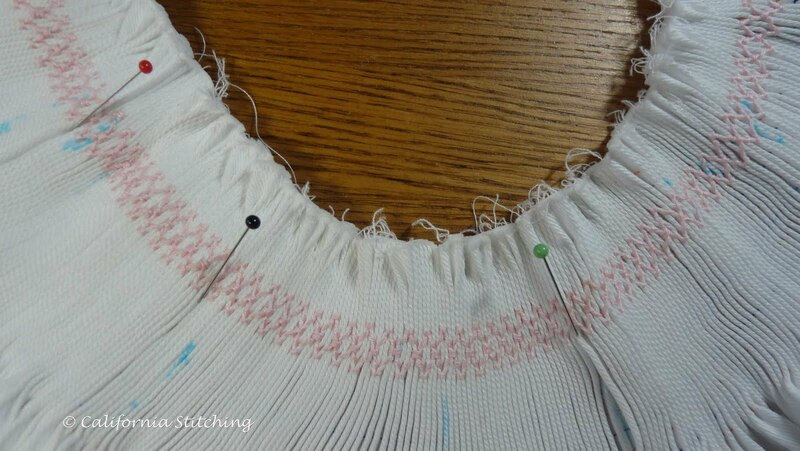 In this method, you don't sew the pieces together until after the pleating is finished, which means you have to rethread the pleater needles for each piece. With a bishop, that's five times! This is the pleated bishop, with the seams sewn in. This method took a good long time, but it was worth it. 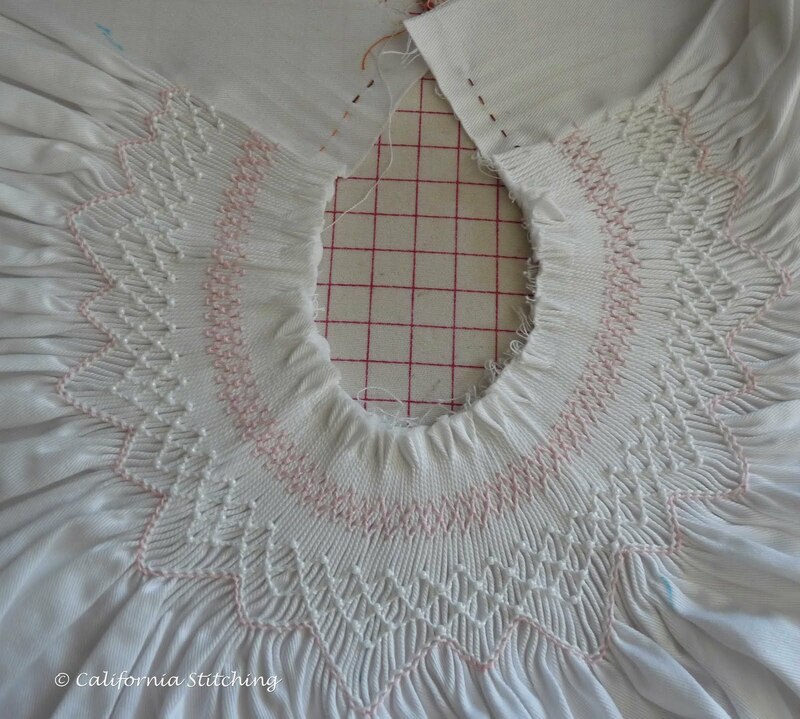 If I had tried to pleat it with the seams sewn, I would have broken many, many needles and probably would have been driven to drink. Pleating just isn't my strong point. The colored pins point to three of the seams. You can see them slightly, but I think it will look better once completely smocked and the threads removed. The smocking pattern is from an old Australian Smocking and Embroidery called "Little Wonder" and I have no idea which issue, as I've already put it away and it isn't printed on the pages. I tend to copy the pages of the magazines to work from so I don't destroy the magazine while working on the project. I haven't decided on the trims yet, but will just work it as I go. The two rows shown above will have ribbon woven through them for an unusual touch. I'm using DMC floss in light pinks, 961, 962, 963 and white, with 989 light green for the leaves that will eventually be added to bullion roses. 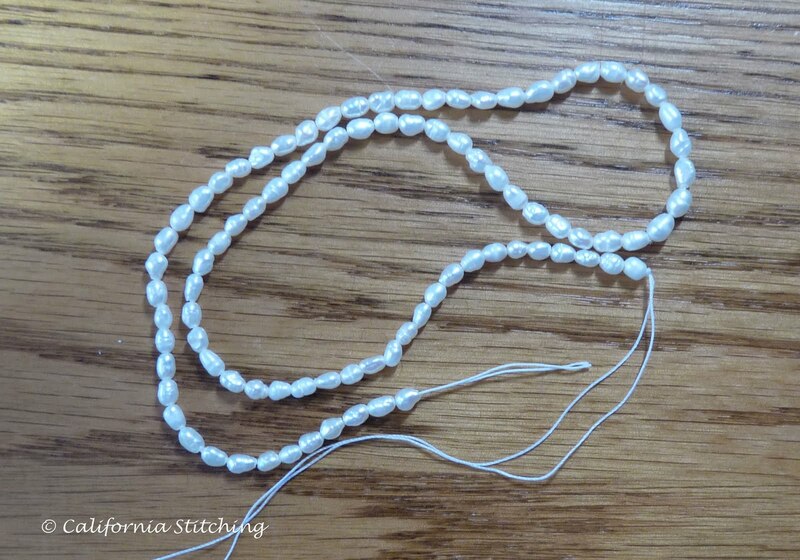 It also calls for beads, which I really like on smocked gowns. And here is the bottle of wine that I brought to the neighbor's barbecue. Martha Stewart I am not, but they were impressed. Our neighbors are having a Fourth of July Barbecue tomorrow, as sort of a "Thanks for putting up with us during our remodeling". Being the shameless copycat that I am, I decided to embroider a kitchen towel to put in a little housewarming basket for them. 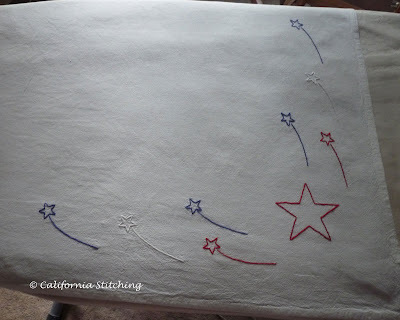 The idea came from Mary Corbet of NeedlenThread.com, in which she embroidered a cotton towel from American Chair Store. Now I've mentioned before that I'm no designer, and that trying to come up with an original pattern tends to hurt my brain. But I do have a goal for this year to design something on my own, and here it is July with half the year gone and no original design. I drew the starts on Power Point, printed and cut them out, and taped them onto several sheets of graph paper to make a corner design. I used a french curve to get the swooshes just right. 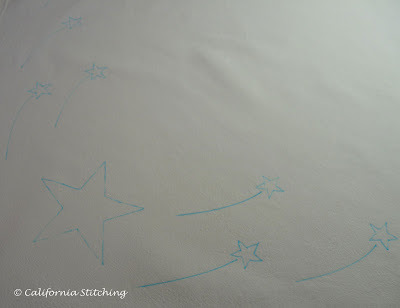 Mary's article is about using Transfer-eze to transfer the pattern to the fabric, but I don't have any, so I used a blue washout pen over a light table. On little trick I learned is to use a glue stick with repositionable glue in it, think Post Its in stick form. 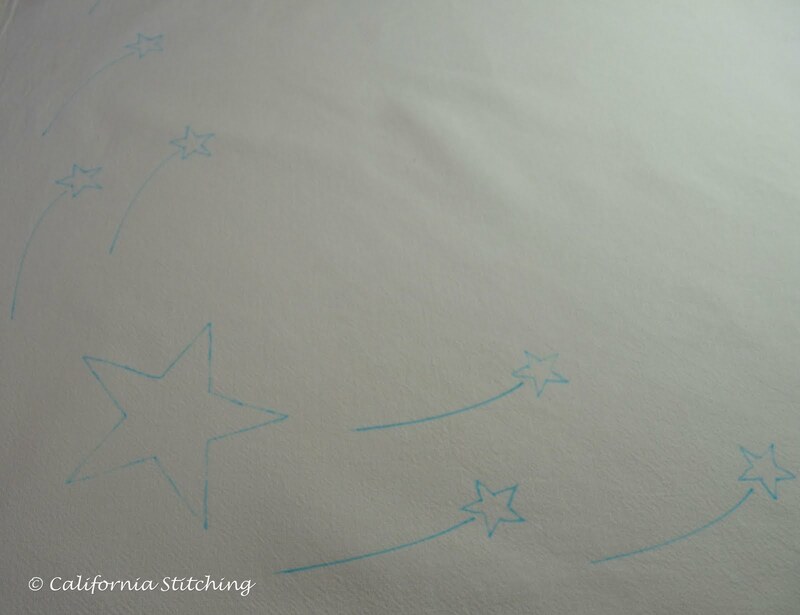 Smear it on the paper, avoiding the printed parts, then lay the towel over it and smooth the bubbles out. 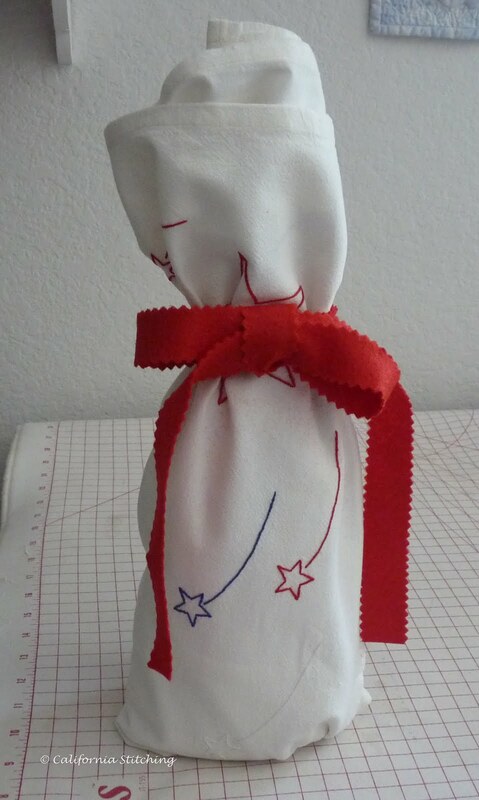 This works best on fairly small projects that you will throw into the wash, such as towels, hankies, baby clothes, etc. I wouldn't use it for Really Nice crewel or silk work. 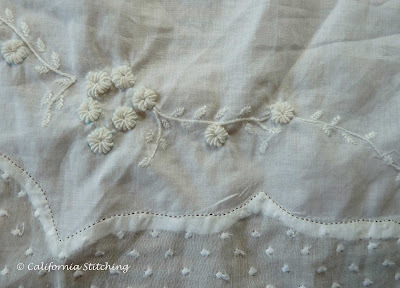 I do have some Transfer-eze on order for an upcoming crewel project. I put the fabric in a cheap 6 inch hoop and started stitching away with DMC floss in white, 321 (red) and 797 (blue) and a size 8 embroidery needle. I was over half way finished when I gave the fabric a more than a little tug on the side and the darn towel ripped! This is what I ended up with after tearing the fabric along the hole, an 11 by 30 inch piece of partially embroidered towel! So now what? You guessed it, I started it all over with a new towel (luckily they come in packs of 10). But this time I put it into my nice 10 inch wooden hoop with a sit upon stand that I got for Christmas the year before last. What I found was that having both hands free I can stitch much faster and got the project finished in one day. And the deep wooden hoop holds the fabric much more securely that the cheap plastic hoop. So now I'm off to find a nice basket and some goodies for the party! This is a really simple design, and didn't hurt the brain too much, so I don't think I can count it toward my design goal. I'll have to do something more complicated (and painful). Buy more than you need! It's always good to have extra supplies in case of disasters. I also have all of the DMC colors on hand along with a color card, which makes it easy to pick the right colors. 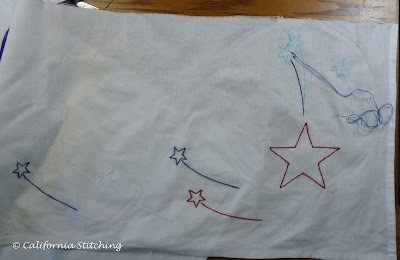 I really like the idea of having these towels around to stitch up a design for a quick gift. The internet is full of free design downloads which are just right for quick and easy gifts. You can also get ideas from looking at machine embroidery designs, especially redwork designs, also these do tend to get a bit fussy. So what to do with the torn piece? I haven't decided, but am kicking around some ideas, such as stitching up a mirror image and joining the pieces with a colored band. 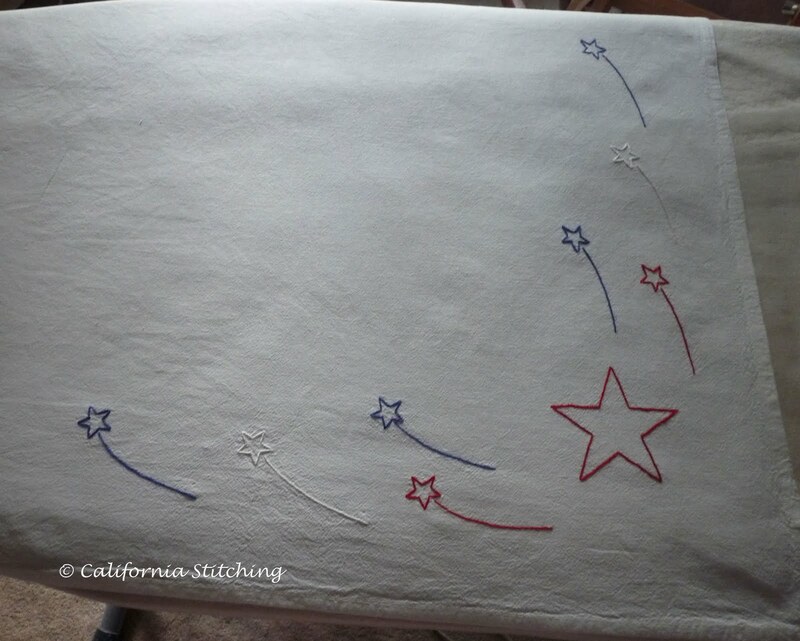 I have plenty of good patriotic fabrics laying around. Now it's off to work on baby clothes! I'll post about that as soon as I have something interesting to show you. It's finished! My darling little Tatted Baby Bonnet that I purchased from a local antique mall. I agonized for several days on how to finish it. If you remember, the original had a row of gathered silk ribbon all along the front of it. I thought of making a row of shirred smocking, similar to that on my Smocked Pockets Tote Bag, that you can barely see along the top of the smocking. 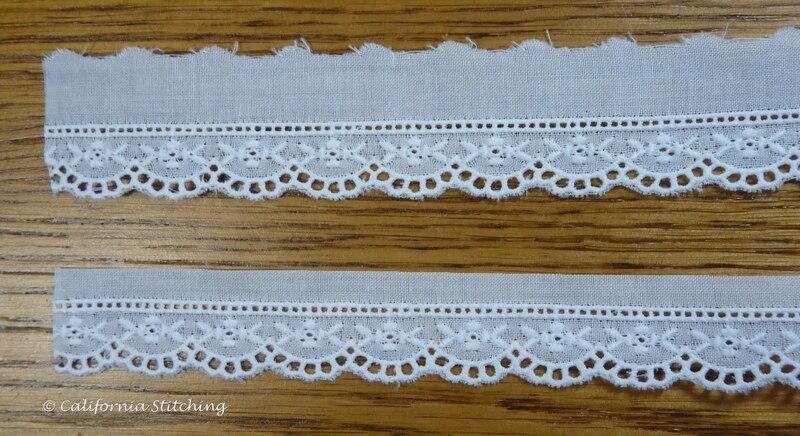 But as I thought about it, I decided not to put any extra trim on it so as not to detract from the lovely tatting. Then I had another bout of agonizing over how to attach the ribbons. 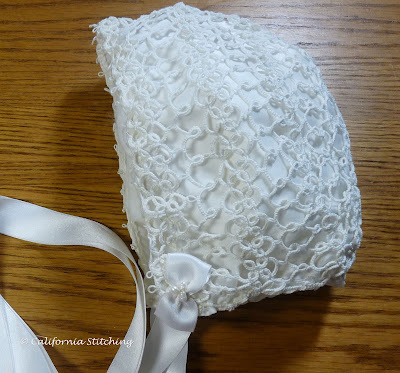 At first I wanted to make rosettes, as you can see in this lovely bonnet by Jeannie Baumeister of Old Fashioned Baby. However, each rosette takes three yards of ribbon, and I only had five yards total. And I would still need some for the ties. 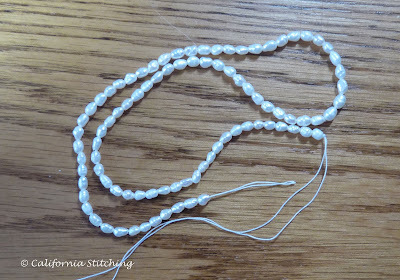 So I opted for a simple tie in which I turned under the edges, gathered with thread, stitched them to the bonnet and added three pearls to each. Sweet and simple. It is now Friday morning, July 1, the beginning of my five days in a row off! I have lots of plans for stitching that I plan to share with you. 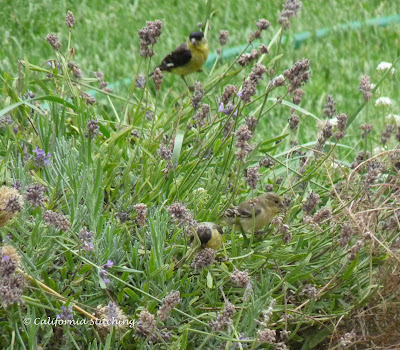 I also have plans for cleaning, laundry, planting, etc., which, never fear, I will not share. It's going to be a hot weekend, getting to the low 90's by Sunday. But here in my corner of the world, the lows are still in the low 60's at night, and it is most decidedly not humid as it is in the Midwest and East. It's lovely weather all around, perfect for a long Fourth of July weekend.